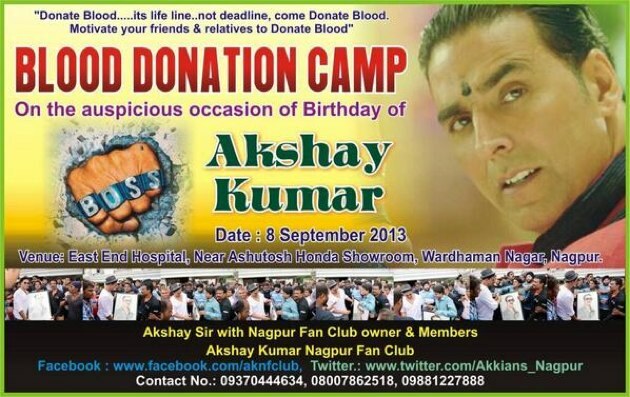 Bollywood CineTalk: Akshay fans organise blood donation camps on his birthday! 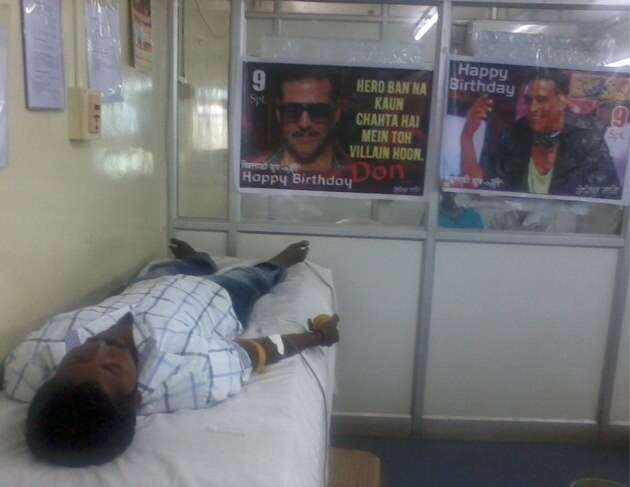 Akshay fans organise blood donation camps on his birthday! 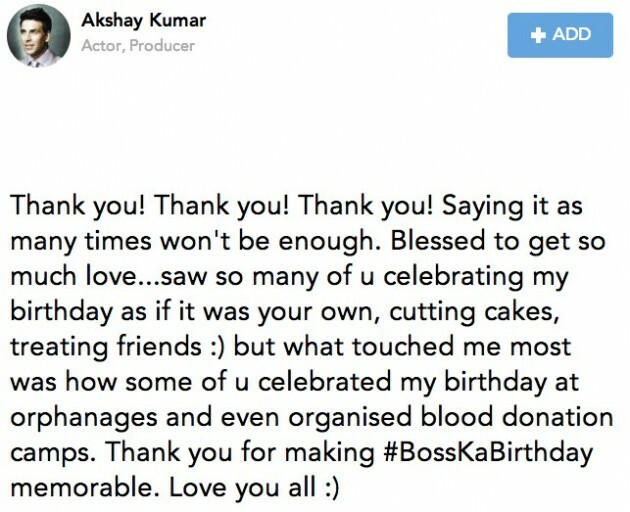 Celebrating your idol's birthday is very common and fans usually do much crazy things, but what Akshay's fans did on his birthday is truely very noble and amazing. Therefore we think they deserve a whole article on Bollywood CineTalk. Bollywood's original Khiladi, who has turned Bollywood's boss, celebrated his 46th birthday earlier this week. Our own Khiladi is a great human being, non-alcoholic, punctual & humble, so a perfect idol for his fans. Fans of the superstar celebrated his birthday in unique and noble way. 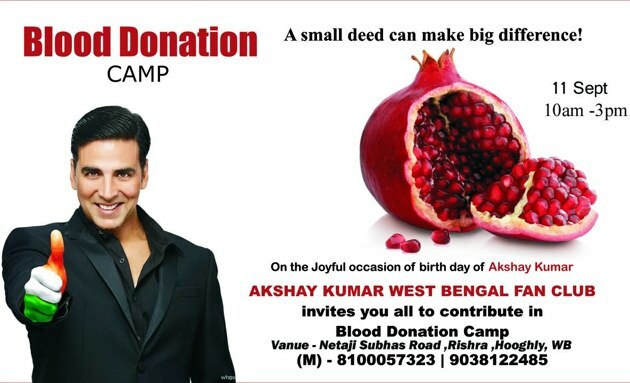 While online fans started the day by trending #HappyBirthdayAkshaySir and #BossKaBirthday worldwide, Fan Clubs of the actor came up with an idea of organising blood donation camps on the birthday of their much-loved hero. The first fan-club to take the initiative were @AkshayNagpurFC who organised a Blood Donation Camp on 8th September at East End Hospital, Nagpur. 56 members donated their blood at the camp. On 9th September, Akshay’s Nagpur Fan club went to an orphanage where they celebrated the birthday with orphan kids with gifts as soft toys and also donated grocery for 3 months. At the same time, one more Fan Club of Akshay Kumar named ‘Khiladi Group Solapur’ arranged the blood donation camp at Solapur where 36 members donated blood at a camp which was followed by free food to the underprivileged and also distributed free books to school kids from poor families. 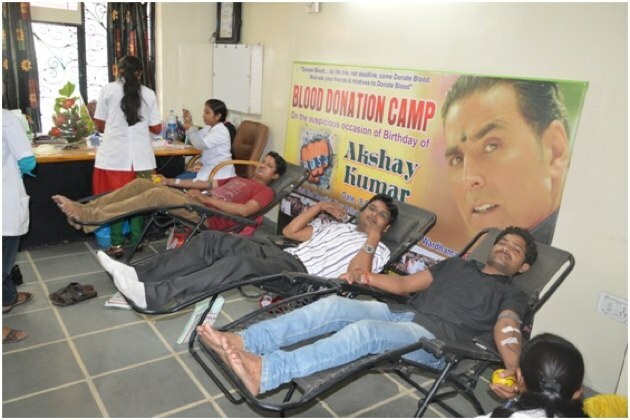 The West Bengal Fan Club of Akshay Kumar (@AkshayKumFansWB) also arranged a blood donation camp on September 11th at Hubli (Karnataka, India). We have a few exclusive pictures from Nagpur, West Bengal FC and photos from blood donation camp. Also pictures from the celebrations at an orphanage in Nagpur and Blood donation camp at Solapur. From the entire Bollywood CineTalk Team, we applaud the initiative taken by the various fan-clubs. Not only did they celebrate their idols birthday, but they also did their bit to make the society a better place to live in.